The shot, Sleeping Giants, was taken during a new moon in Newton, NJ on August 29th, 2011. The image was created by stacking eighty-three 25 second exposures on top of each other for the trails and a separate image was taken for the foreground. 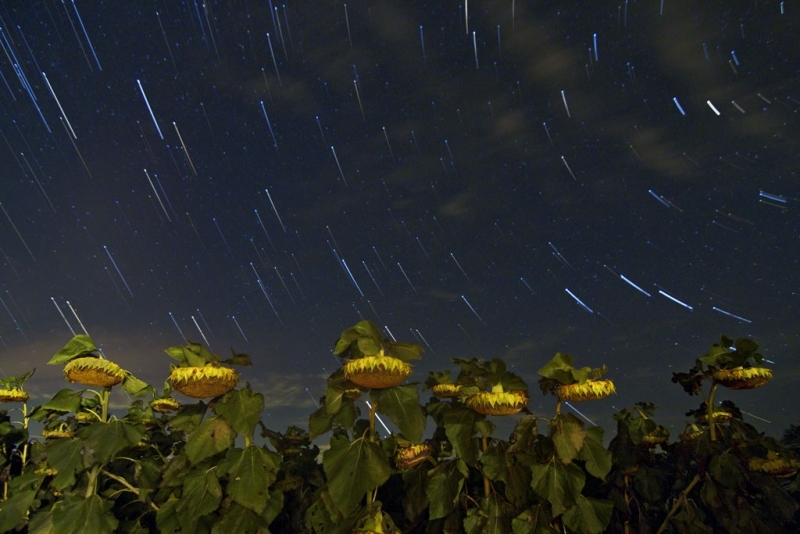 Lacking any light from the moon, I bounced light from a flashlight off of my hand to help light the sunflowers in the foreground of the image. Any direct light from the flashlight would have been too harsh and given an unnatural, fluorescent color to the sunflowers. The trails took on a shooting star resemblance by creating a short delay between the foreground image and the eighty-three exposures used to create them.